It was late-afternoon, right around Mom’s starting to get really tired and not able to make rational decisions anymore o’clock. The school work was all finished, the tomatoes were in jars and their lids had said “ping.” I was finishing some work at the computer and about to get up to start dinner. That’s when my eight year old asked the question. With joy, I smiled and grabbed him up in huge bear hug and said that I could think of nothing better so please start bringing down every Lego we own and let’s also get out glitter. But what I actually did in real life was give him a look which clearly stated, “Did you forget that it is now half past Mom can’t stand the idea of seeing one more mess?” And then out loud I was able to mutter, “Probably not but let me think about it.” Since that was so very nearly a “yes” he ran upstairs to start making Lego zip lines. After dinner, he brought up his idea again, which had now developed into a bigger attraction since his original idea about transforming our living room wasn’t quite big enough and now the kitchen table and countertops needed to be included as well. Dinner had helped my mental state significantly, but no amount of protein can make me excited about turning 1000 square feet of house into a Lego Adventure two hours before bedtime. Together we came up with a compromise. He could make the signs for the door. I would help. And he could use the kitchen table if he helped clear it off first and if he promised that I wouldn’t be finding Lego bricks in the butter two weeks from now. I’m not sure I’ve ever seen him so excited. Some of his brothers even joined in. They set up the entire table with a Lego Adventure any dad would be pleased to see after being away from home, on the road, and in the hot sun for 16 hours. I am happy to share that not only did saying yes to Malachi’s request bring him much joy, it didn’t even kill me a little bit. Perhaps I should get past my I love how creative you are but can’t we just this once sit down and read books quietly feelings more often. 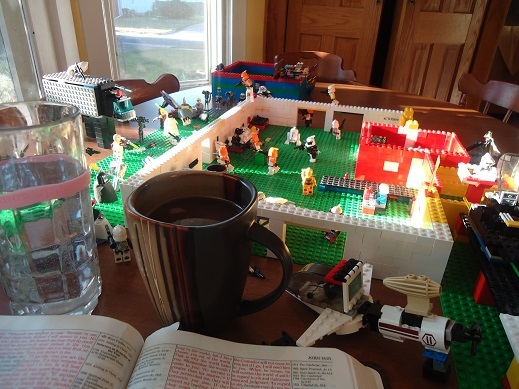 The next morning, God and I were able to share our quiet time with no less than 47 Lego guys, some of whom were balancing on one leg even better than my yoga instructor. 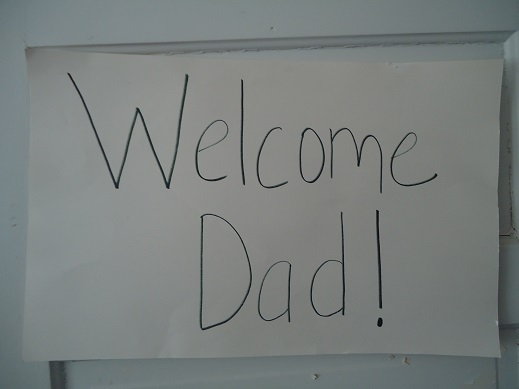 Matt had loved his welcome home – from the sign on the door to the Lego Adventure that made us all hold our breakfast plates in our laps as we ate together that morning. Would you look at that. We forgot the glitter. This is awesome. It brought back memories since my youngest of 4 is now 19! My two oldest used to set up a baby gate to lock the two preschoolers out of our large living room and turn said room into a lego city complete with cardboard roads. I have video footage of this. The preschoolers would stand longingly at the gate, waiting to have a “tour” by holding an older siblings hand. They were so mesmerized by this creation of their older brother and sister. I love legos, though stepping on one with a bare foot is one of my least favorite things to do. Great job letting Malachi make a memory. This made me chortle. And i don’t chortle enough. I have to say, I could write an entire post about the dreaded glitter and also the tendency for my boys to both suddenly want to start fingerpainting at 5 pm. Sigh. LOVED this. Thank you!! Two of my girls were cleaning out the craft supplies in the middle of the living room floor yesterday. There was glitter everywhere-on the floor, on faces, in hair, etc. Thankfully it was bath night anyway and a vacuum took care of most of the rest-but I am still finding it around! I concur about the glitter. Also, it is obvious the sign was made by a boy. If a girl had made they would have done rainbow letters and added hearts and butterflies or something, ha, ha. Good for you for giving in! I so often say no to stuff like that when my husband is out of town, I am exhausted and it is close to bedtime. I’m trying to make a conscious effort to say yes more often (and am eager to see their little, joy-filled faces)! Sometimes we get cought up in the cleanness-freak mode, that we forget that fun for our kids sometimes mean to have a messy house for just a day! I smiled as I read this thinking of how I soooo understood where you are coming from! I can’t tell you how many times I vowed to pitch all of the legos if I stepped on one more, had to pick up one more, or had to balance one more lego creation that cluttered my nightstand, my desk and nearly every table in our living room. Once I even slipped on some left on the floor and ended up in the emergency room of all places for stitches! Then as I read the comments, tears poured from my eyes as I thought of how quickly my oldest has grown up and now messes up our kitchen table, the living room, his room, and our garage with his computer equipment, miles of cords and what looks to me to be nothing but junk. His brothers and sisters still have the legos and yes they are still everywhere. I have one small lego dude right here next to my computer as I am typing this. This was given to me by my five year old a few days ago. How quickly these times fly by. I am so happy your family experienced the joy of dad’s homecoming. I too find it hard hold my tongue and fight the inclination to become totally frustrated from all of the mess. A Christian woman shared this verse with me years ago. I try to think about it when the work and endless creative projects get the better of me. Thank you for sharing this with us. It was just what I needed today. “And lets also get out glitter” ah ha ha!! I laughed out loud. I love your writing, Laura! Sweet post!!! How much joy the boys must have gotten. I too was guilty of not wanting a mess when my boys were small. Got better with the 3 grandsons but even better with our great grand daughter. So fun having a little girl around. I join you in applauding your generous boys, Laura 8->! We’re “transitioning” from Lego to more adult-like ideas, hopes and dreams. It just takes my breath away, how fast this all goes. Thank you for letting us be part of your day. This made me laugh. out. loud! I even read it to my husband, who also thought it was great. We also have four boys and LOTS of Legos. Sometimes the boys’ ideas involve a lot of mess, but we do want to encourage their creativity! Thanks for the reminder! It’s so nice to be reminded to say yes whenever I can. Thank you! I found a resource tonight and immediately thought of you!